The Manitowoc RCUF-2200 ice machine compressor is compatible with the RFF-2200C unit. 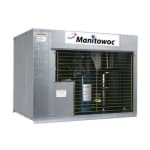 Operators can install this condensing unit away from the ice maker, which may be in customer-facing areas. This isolates noise and heat production in these spaces. It can be installed in places with ambient temperatures from -20 to 120 degrees Fahrenheit. More information on commercial ice machines can be found in our ice machine buyers' guide. In this guide, we cover some of the features and benefits of remote compressors.